First 888poker-branded event of the year kicks off on Friday in Alpine city of Innsbruck, Austria. A whole new season of the 888live series is about to begin. The first 888poker-branded event of the year kicks off on Friday in the Alpine city of Innsbruck, Austria. Built around a $50,000 guaranteed two-day $400 Main Event running on February 5-6 at the Casino Innsbruck, the first 888live event of the season aims to replicate the success of last year's edition, when 115 ponied up the buy-in to play in the tournament boosting the prize pool to €45,540 and smashing the €40,000 guarantee offered by the poker room. Back then, Germany's Thorsten Facius emerged victorious and almost $15,000 richer after an heads-up duel played with Bosnia and Herzegovina's Andelo Bozic. "We are expecting more players than in 2015 and I can promise everyone that this is going to be an awesome tournament. We invested a lot of time in planning this tournament and everything - from the event's structure to the fun activities - has been fine-tuned to perfection," a representative from 888poker told PokerNews. With an exceptional host like Tatjana Pasalic and pros like Dominik Nitsche and Sofia Lovgren in the field, the poker room strongly believes that the event will be one-of-a-kind as it will give everyone the chance to play in an international live poker event, compete for a premium guarantee, and enjoy a vast number of extra poker fun activities, all for an affordable entry fee. "This event gives everyone the opportunity to spend a weekend in one the most charming locations in Alps and play poker at the same time. 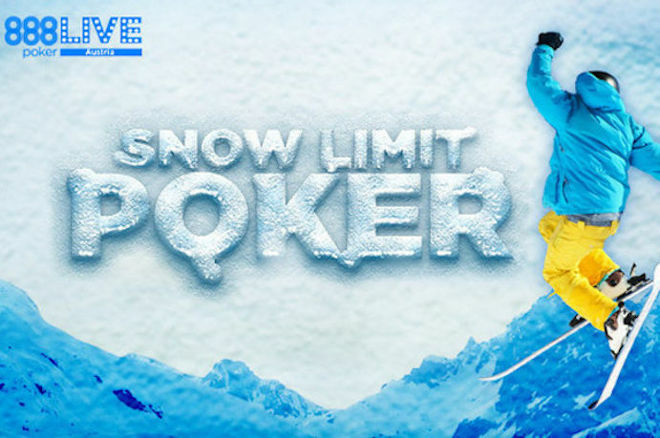 At 888poker, we believe that fun is an important part of the game, and that's why the packages we made available through our online satellites included flights, accommodations and fun activities such as skiing and parties." "We want everyone to have a great time," the room's representative continued. "That's also why the 888poker's players knocked out on Day 2 won't walk away empty-handed but will get one entry to a $5,000 Bounty Free Tournament as a special gift. Although the Main Event doesn't start until tomorrow, February 5, the players are expected to start gathering in Innsbruck today to enjoy a welcome toast and a special freeroll kicking off at 22:00, where all the plus ones who have joined the online qualifiers will have the opportunity to ship a ticket to the Main Event. On Friday, before things get serious with the first shuffle up and deal of the season, the 888live crew will bring their guests to the Ski resort Innsbruck Igls for a morning of skiing and snowboarding. After that, at 16:00 local time, the players will be invited to take their seats at the Casino Innsbruck to battle for the title and take down the first 888live Main Event of 2016. As tradition warrants, the day will then end on the dance floor of the exclusive Blue Chip Club for the players to socialize and sweeten their bad bet beats over some free drinks. On Sunday, the play will restart at 14:00 for the second and final day of the 888live Main Event. One hour later, the casino will host also a $5,000 Special Bounty Freeroll ready to accommodate all those who will bust from the Main Event. Be sure to tune in with the PokerNews Live Blog on Friday and Saturday, as there you will find all the updates, the best photos, and interviews with all the best players at the event.